Our next excursion took us to the north west corner of the island, near to the small village of Ferraria, just a few km south of Mosteiros. I’d read about an unusual occurrence within the sea here – so unusual that in fact this is the only known place in the world that it occurs. 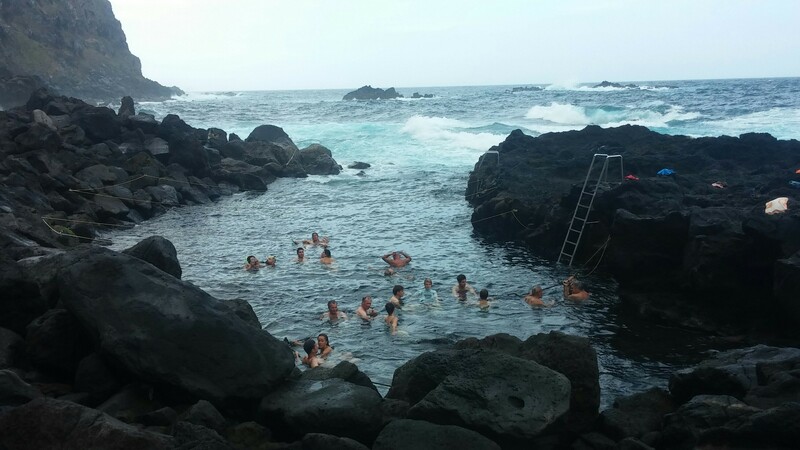 Quite simply, within a small sheltered cove, a volcanic hot spring feeds into the ocean. Its water reaches a temperature of around 65 degrees Celsius, but at high tide, cold sea water rushes in, mixing with the hot spring water, and produces an ocean bathing experience similar to getting into a hot bath. Now I will take almost any opportunity to swim, so this was a unique experience not to be missed. We drove down a steep, winding road to a car park set a little back from the sea. There is a spa business here too, and a restaurant but both were closed at the time. We went at around 11am, when the tide was in, but it’s worth checking seasonal tide times if you’re visiting. The access to the pool is across black volcanic rocks, and so surf / water shoes are advisable; your feet will be grateful. You lower yourself in using a ladder, and immerse yourself into a strange black, rocky environment where hot sea water swirls around you. A network of ropes criss cross the pool to hang on to – necessary if like us, you go when the water is choppy and the current quite strong. The pool is shallow at the near end, but rocks hide under the surface so take care to observe what is around and beneath you – John got swept against a rock and ended up with a bit of a bruised knee. The experience, while maybe sounding a bit risky, is nothing short of exhilarating. Gazing out at the choppy, blustery ocean and feeling the heated spring washing waves of hot water around you, interspersed with cold sea water was incredible. An experience not to be missed. There were plenty of other people in the pool and it’s popular with the locals. There are some toilet and changing facilities nearby. Next stop was the town of Furnas, nestled amid volcanic mountains, south west of the island. 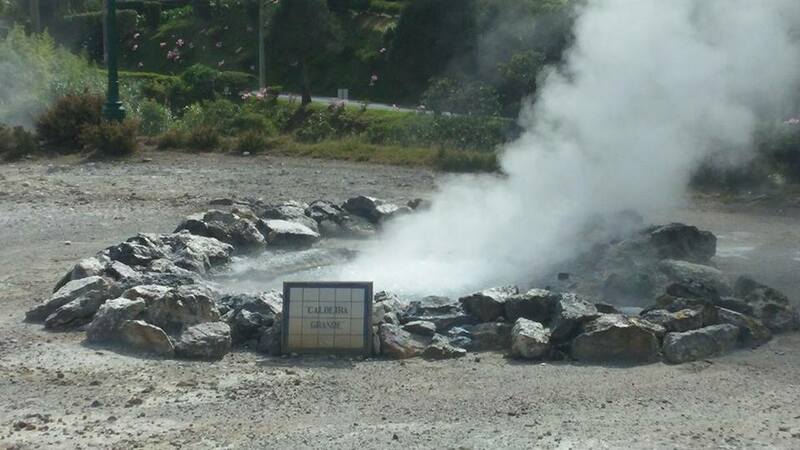 Furnas is famous for its caldeiras – volcanic springs which bubble from the earth producing jets of hot steam and raging waters. It feels almost prehistoric, watching these feisty pools churning away. Local people use them to cook in – they lower sacks and pots of meat and vegetables into the caldeira and leave them simmering away. We tried a corn on the cob – perfectly yellow and incredibly tender and sweet. The area is filled with the odour of sulphur, but is not unpleasant. There are also some 27 natural springs here producing cold drinking water to sample. We tried a few, the first tasting a bit like Alka Seltzer! 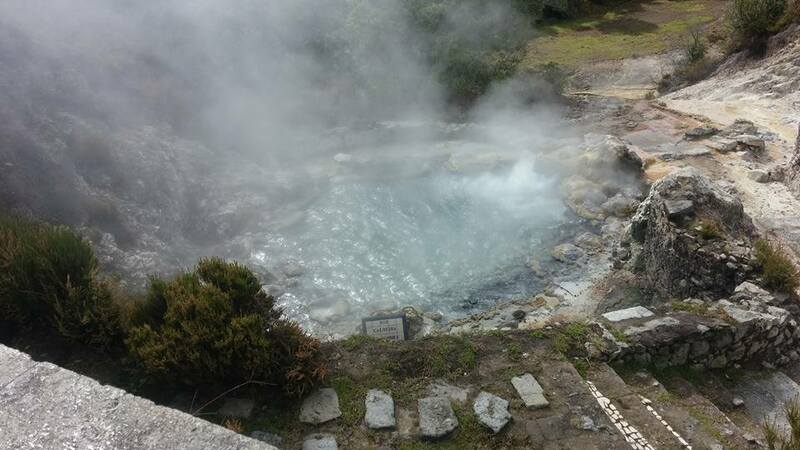 As well as the caldeiras, Furnas is also known for its thermal outdoor pool, set in the botanical gardens of Terra Nostra. For 6€ per adult, you gain entrance to the garden which is situated at the rear of the Terra Nostra hotel. We had a pit stop at the hotel terrace for lunch and found they served a vegan chickpea burger with salad and chips, which was a result! 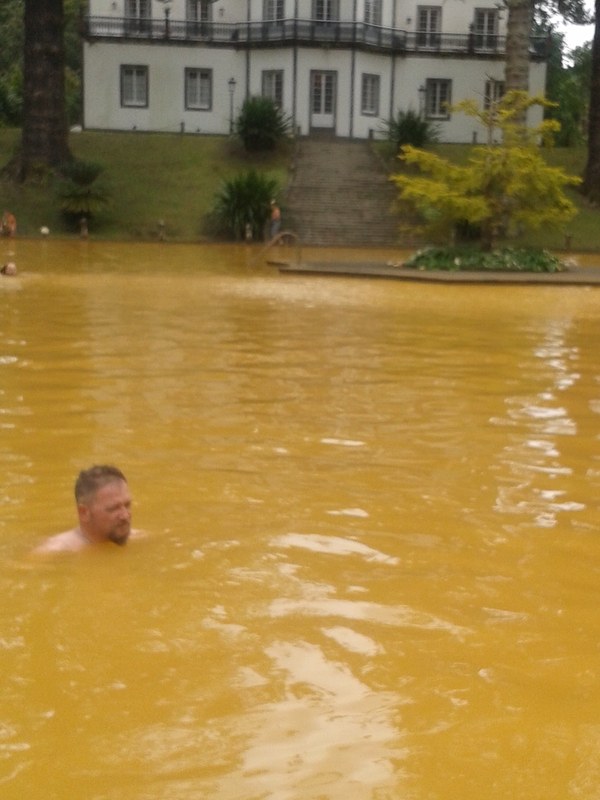 The thermal pool is the colour of mustard and fair warning, the water will stain light coloured clothes or towels so be certain not to wear anything precious, like your favourite white t shirt! There are changing facilities nearby but most people were getting their kit off next to the pool. It is in gorgeous surroundings, flanked by the estate manor house and various flora. Very tranquil. The pool is shallow, around 6feet max depth. Once in, it felt like being in yet another warm bath and was blissful. We visited when the weather was a little cloudy and not too warm, and this felt perfect. We stayed in for over an hour, until we were wrinkled and ready to head off. The showers were cold however but worth it to get the yellow water out of your hair and costumes – we emerged from the pool looking like we had badly applied fake tans…. So a stroll around the gardens ended our trip. A good assortment of native and non native plants and trees. Gardens are not really my thing but this was very pleasant. We somehow took a wrong turn when leaving and missed our drive back past Furnas lake for some photos. But we saw it on the way in and it was pretty stunning. The drive in was gorgeous too – the roads are lined with hydrangeas and azaleas (typical Azores). Really pretty and of course, those rolling green mountains all around.